Google Plus isn't the ghost town it's made out to be if you dig into the communities that find a home there. “Photos in this category should contain a WILD animal,” the contest rules read. “The animal may be in the wild or in a zoo or conservation area. NO dogs, cats, pets, or domestic animals are allowed. Only original photographs are allowed.” Though the community could comment, share, and “+1” the photo entries, a small group of moderators would choose the winners. Over the next several days, I watched in awe as dozens of breathtaking photos began to appear on the contest page. Though the photographer skill level varied, there were many that looked, at least to my untrained eye, as if they belonged between the pages of a glossy magazine like National Geographic. And it was obvious that I wasn’t the only one perusing these photos; several of them had dozens of comments and +1s. The winner, announced on September 4, was uploaded by a Canadian named Nancy Dempsey and depicted a humpback whale breaching the water’s surface. Nearly 80 people chimed in to congratulate her. Launched in December 2012, the communities tool has become one of the most vibrant and popular features on the Google Plus platform. Like Facebook groups, communities usually focus on a particular topic. (Some of the most popular communities include Science, Photographers, and Space.) Anyone can launch a community, thereby becoming a moderator, and then that person can approve other users as moderators as well. Moderators have broad administrative powers that allow them to delete posts (those that are off topic or spam), create subcategories (the Landscape Photography community has more than 10), and pin posts to the top of the page so they can gain more visibility. Despite Google Plus’s impressive growth numbers — it announced last year that it had reached 300 million monthly active users — it has been perennially regarded by many tech reporters as a failed social network. A New York Times piece in February declared the platform a “ghost town,” only for the reporter to publish a blog post a few days later after receiving dozens of comments and emails from annoyed Google Plus users who declared it anything but. Any growth numbers announced by Google have been met with skepticism, even when third-party sources have backed up the company’s claims. For instance, a report from comScore listed the Google Plus mobile app as among the most popular within the App Store. (A Quartz Facebook post asked, incredulously, “Who is downloading Google Plus?”) A Forrester Research analyst found that brands see twice the engagement on their Google Plus pages than they see on Twitter. So why the disconnect between what Google claims about the social network’s engagement and reporters’ declarations that it’s essentially dead in the water? Much of it can be ascribed to the tyranny of anecdotal observations. Reporters who have spent the last several years building presences on Facebook and Twitter will briefly dip into Google Plus, look around, and then declare it uninhabited without searching for more engaged users. There’s also some evidence that the social network appeals to certain demographics over others. According to market research firm GlobalWebIndex, the network has seen some of its strongest growth in developing nations with still-emerging Internet populations. To find and interview some of Google Plus’s most engaged users, a reporter could simply visit its most popular community pages, some of which receive hundreds of forum posts a day. The Science community, for example, has more than 400,000 members, and a Gif posted by one of its members on the morning that I’m writing this has 251 +1s, 50 shares, and over a dozen comments. So who are these users gravitating to Google Plus communities? I posed this question to Margaret Tompkins, an amateur photographer who “used to build databases, really big ones, for the government” and now moderates the Landscape Photography community. “Definitely the most active ones are amateur photographers,” she said of her own community. “These are people who are trying to go from the mere snapshot phase to” learn how to manually shoot and edit photos. According to Jay Patel, the founder of the Landscape Photography community, the pedagogical offerings of the community are what make it so appealing. The soft curved lines in the sand are great leading lines to get the viewers eye into the scene. I wish they were a little more enhanced. Actually focus will not help much in what you were trying to accomplish. That is all done in exposure. Unless you are going for an abstract design then I would focus about 1/3 of the way into the scene with a large f stop like an f16 or greater. This will make the scene in focus front to back. The community’s massive growth (it boasts nearly 400,000 members), Patel said, can be attributed to how it’s designed to appeal to users’ egos. Many of the largest communities are growing at a rapid pace, a growth rate that has only continued to pick up in the past year. Dr. Zuleyka Zevallos, a Melbourne, Australia sociologist who is one of the moderators for the Science community, told me that Science has grown from 300,000 to 400,000 members in just a few months. And it was obvious, after spending more than an hour perusing through the community, that its moderation team of “20 qualified scientists who have PhDs, peer reviewed publications and who work in universities or as researchers” take the responsibility of managing such a large following seriously. Its subcategories are divided among several scientific disciplines, ranging from earth science to physics, and each category is fastidiously policed to weed out pseudoscience and off-topic posts. 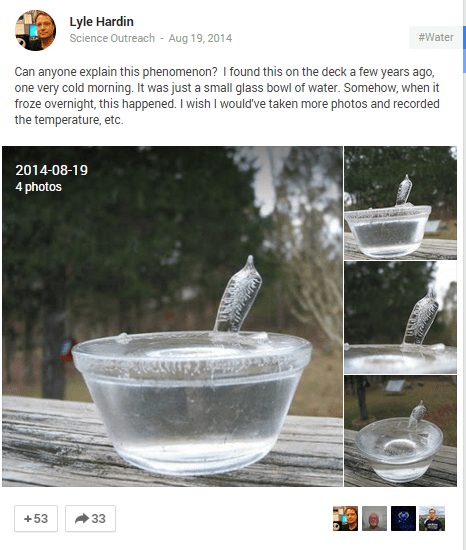 The moderators often promote the best of these discussions via a regular series called “Curator’s Choice.” In August, for instance, a community member posted a photo of a bowl of water that had curiously frozen in such a way that seemed to defy gravity. A user named Casey Webster, who describes himself on his Google Plus profile as a meteorologist and programmer, posted a detailed roundup of research that explained how water vapor gradients can cause ice to spike when it freezes quickly. In another Curator’s Choice post, a fifth grader asked about the layers of the earth’s crust, a question that a user named Jonathan Chung devoted 400 words and a half dozen cited sources answering. “The types of posts we get range from introduction to key science topics such as how computers work, to more complex topics such as on various cancer research,” said Zevallos. The educational offerings of the Science community go even deeper. A category called “applied science” adopts the ethos of maker culture by providing step-by-step guides to users who want to build machines or practice science experiments on their own. Jonah Miller, for example, posted a tutorial on non-digital computers and how to build them, and another explains how to make “glowing glue.” Many of the communities I visited while researching this article, including Science, made ample use of Google Plus’s Hangouts on Air tool, which allows users to broadcast and record their video chats. There are dozens of regular low-tech Google Hangout “shows” in which real scientists are interviewed and answer questions posed by viewers. Professional educators have begun to notice how effective these tools can be. An educational technology blog published a post encouraging teachers to create Google Plus communities for their classrooms and use them to create and foster discussions, post helpful links, and schedule class events. And occasionally, the online relationships fostered within Google Plus communities can lead to offline interactions as well. Naturally, she later uploaded several of her photos to Google Plus. Most of the people on google plus dont actually want to be on google plus but have no choice but too because google keeps trying to link everything and make it mandatory with preset options that share your stuff. I find the opposite to be true. The whole “forcing” issue seems to be more of a trendy cliche than anything from my perspective. Of all the people I interact with on G+ on a regular basis, all seem very happy to be there. I just ran into the problem again which is how I stumbled on this article. Google+ trying to get my location and picture just so I can play a simple game. Its trendy for a reason because its been happening to so many people. You are the first person I’ve seen who actually likes it. It likely comes down to the difference between those who actually use the network versus those that don’t. I am talking specifically about those who post, share, and comment on G+. There are plenty of very happy people doing this. Its almost always those who don’t have interest in these things that are the one’s complaining. You don’t hear from many happy users because there’s no real point in going out of your way to post that you’re happy (the irony here notwithstanding). I don’t actually understand the issue you described but I emphasize as I agree that Google tends to have some very clunky processes. Keep in mind though, FB had the same type issues, they just aren’t as broad. To play games on FB you are pushed to share information in the same manner. As I say, its just more popular to complain when Google does these things. Thank you Simon for this well researched article. I think any reporter that says Google plus is a ghost town has not spent much time on it. Sure, there are some areas that are “dead” but that is and always has been the same on Facebook too. 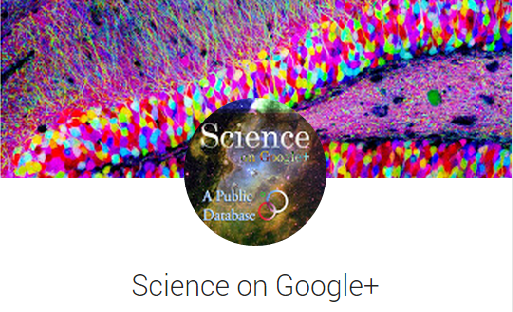 There are tons of active people on Google plus. I run one community that went from 800 people to 20,000 people in two months. It is not a ghost town. I’ve now got to witness this odd phenomenon several times now, of something crashing and burning on release, and then watching the sometimes years of debate by contrarians that it’s actually going well and that all evidence to the contrary is anecdotal, since private analytics are kept that way by the company and all further evidence is declared anecdotal (whether it actually is to someone with a science education who knows what that word means, or not). Google themselves declared Google+ a failure that didn’t attract a base, pulling the rug out on those maybe not intellectually capable enough to see the obvious, though it allowed them to bloviate nonsense for years before they bothered to do so.